We work to craft great hard cider using only fresh pressed juice from Midwestern apples. We never use fruit shipped from halfway around the world, and never, never use juice concentrate. We believe respecting this time honored tradition of staying close to the land is an important part of crafting a great cider. But, like any pioneer entering new territory, learning to innovate while keeping the best parts of your traditions is key to success. 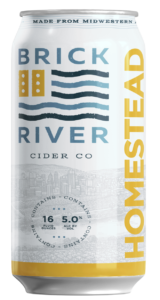 So in addition to traditional time tested cider styles, expect us to bring new and refreshing styles and flavors to you all the while staying true to our support of regional agriculture. Unfiltered, cloudy & semi-sweet farmhouse style cider bursting with fruit – as close to the orchard as it gets. 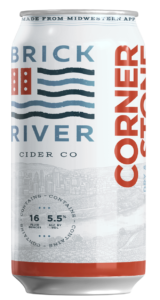 Classic semi-dry crystal clear effervescent cider with clear notes of fresh apple & hints of the earth from which it came. Our Cider Maker's take on dry rose. Tart and complex, with Michigan Montmorency sour cherries and hibiscus tea blend. Besides our brand new - Sweet Lou's lightly sweetened apple, blueberry, and lavender hard cider -currently on tap, we also have four rotating local beers on draft. Follow us on Instagram and signup for our email list to be in the loop with all Brick River specials, events, and new releases!